Wales’s biggest theatre festival launches 2017 programme. What do a vivacious vicar, an ambitious warrior and a host of Monty Python characters have in common? They’re all part of this year’s Cardiff Open Air Theatre Festival. Everyman Theatre, Cardiff’s premier drama company, has just announced this summer’s programme of outdoor shows. Now the largest event of its kind outside London, organisers promise 2017 will be the biggest event in its 35-year history. 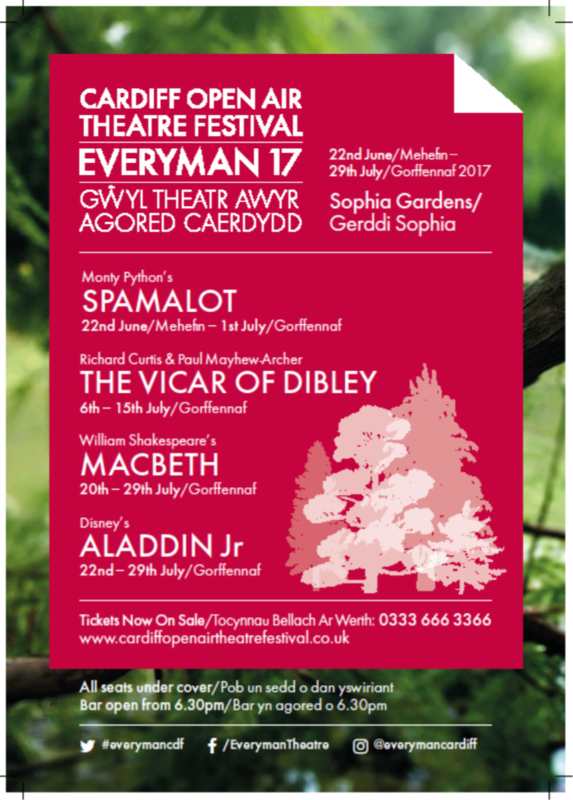 Macbeth, The Vicar of Dibley and Spamalot are among the seven shows being staged in Sophia Gardens during the month-long festival in June & July. Taking on the role of Macbeth in one of Shakespeare’s darkest dramas is Steven Smith. He played Bottom in an RSC production of Midsummer Night’s Dream to critical acclaim. Tickets for the festival are already selling well – with record takings so far. The event attracts 20,000 people to Sophia Gardens every summer. Festival director Paul Williams said organising it was like “birthing an elephant”. Meanwhile Everyman stalwart Brian Smith, who delighted audiences as Blackadder in 2014/2015, will be taking on another comic historical role – King Arthur in Monty Python’s Spamalot. Also performing in Spamalot as the Lady of the Lake is Laura Phillips. Last year she played the Baker’s Wife in the festival’s acclaimed production of Sondheim’s Into The Woods. She gave a preview of her role as the Lady at the festival’s launch event Thursday evening (9 March). It was held at No.10 on Cathedral Road. The venue – formerly Jolyon’s – has formed a partnership with this year’s festival and will provide theatre goers with pre-show suppers. Disney’s Aladdin Junior, Everyman Youth’s take on Twelfth Night, a cabaret night and a charity comedy night complete this year’s offering of diverse drama and entertainment.